The statue taking shape earlier this year. North-east students have created their own life-size sculpture to cap the academic year. North East College Scotland College (Nescol) students were given the honour of erecting their steel statue in the courtyard of the school’s Fraserburgh campus. The pupils had designed, crafted and built the Scholar of the North sculpture over the last 10 months as part of their Performing Engineering Operations class. And, last night, a spokeswoman for the college said everyone was “proud” of their efforts. 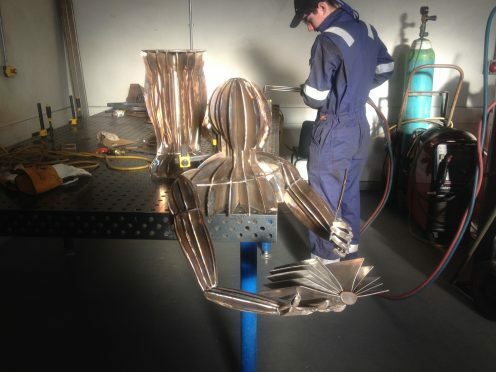 The striking sculpture stands at 5’8” and holds an open book – also made of steel. Martin Summers, lecturer in welding and fabrication at Nescol, echoed the college’s pride in their pupils’ efforts. He said: “The project has been very successful and has been a good way to showcase the skills and the talents of all involved and I have to admit that it looks pretty impressive – especially in the sunshine. The artwork is the latest addition to the college’s Fraserburgh campus. Earlier this year, Nescol cut the ribbon on an £8million scheme to introduce bigger facilities for the region’s next generation of oil and gas employees – including welders. The extension increases accommodation for engineering, automotive and construction, and also offers more flexible teaching spaces at the campus. The increased space has also allowed the college to introduce science as a subject for the first time. Ken Milroy, chairman of the college’s regional board, said: “The Fraserburgh campus has undergone a transformation since the remodelling of the building in 2012.